As I write this, the strike by West Virginia’s public school employees has entered its third week. The three unions involved — West Virginia Education Association, AFT West Virginia, and the West Virginia School Service Personnel Association — agreed to end their job action after reaching a deal with Gov. Jim Justice for a 5 percent pay hike and a task force that would find ways to rein in health insurance costs. The rank and file rejected that deal, however. They continued the strike against the wishes of their unions (making it a “wildcat” strike). 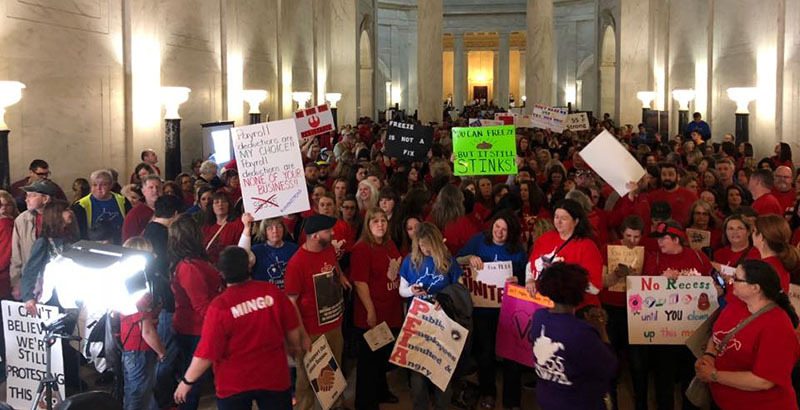 After the West Virginia state Senate offered a bill with only a 4 percent pay hike, union leaders reauthorized the strike until the governor’s original deal is passed by the full legislature. It’s uncertain how much control the union officers have, though, and under what circumstances they can persuade employees to return to work. I have not changed my view. Teacher strikes should not be illegal. Strikes are presumably a last resort when labor and management cannot come to an agreement. In most cases they are a contest on an even playing field. Workers withhold labor. Managers withhold salary and benefits. In the private sector it becomes a test of endurance. How long can a company sacrifice profits and lose market share to competitors? How long can the company’s employees sacrifice pay and health coverage? Both sides put their bottom lines at stake, which amps up the pressure to reach an agreement. But what happens when neither management nor labor makes sacrifices? The government continues to collect taxes at the same rate, and it is not in danger of another government stealing market share. There is public pressure, of course, but everyone from the governor on down to the county superintendents still collects their wages. It’s not much different on the other side. Since the strike began, there have been hundreds, if not thousands, of articles written about the situation. Only a handful mention that the school employees are still being paid while out on strike. Their much-maligned health coverage is still in effect, and they are still earning credit toward retirement. That is because all 55 county superintendents have closed schools during the strike. Strike days are treated like snow days, which means employees will be expected to make up the missed days at the end of the school year. Forcing teachers back to work would require a court injunction, but neither the superintendents nor state officials have made a move in that direction — perhaps because they are unwilling or unable to enforce an injunction should the teachers defy it. In almost all private-sector jobs, people work the entire year. Missed strike days cannot be made up later, so the settlement ultimately reached has to be good enough to make the strike worthwhile. Q: If a teacher chooses to strike, are they paid by the district? A: No. If an individual chooses to strike, they will not be paid by the district for any day(s) they strike. A strike is a work stoppage and strikers are not paid. Retirement contributions to [the pension system] are reduced for each day teacher strike. Q: For days lost by a strike, won’t we just make them up at the end of the school year? A: No. Fresno Unified will remain open, safe and functional in the event of a work stoppage so there is no reason to extend the school year or make up lost days. West Virginia law requires schools to provide 180 instructional days, but this can be waived by an emergency declaration from the governor or by a vote of the state board of education if individual counties apply. So it is conceivable that lost days will not be made up and school employees will have been paid for striking. This places West Virginia legislators in a bind, but it is a bind of their own creation. They can continue to pay the state’s school employees not to work, or pay them a little more to work. That shouldn’t be a difficult decision.